Animal Wildlife | Indian Star Tortoise | The Indian star tortoise is a medium sized species of tortoise found in the dry and arid forests of both Indian and Sri Lanka. 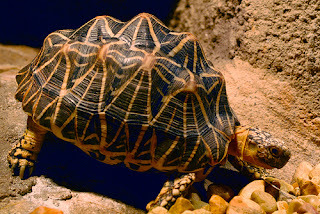 The Indian star tortoise is named for the star-like patterns on it's high-domed shell which are distinctive to both species of star tortoise (the other being the critically endangered Burmese star tortoise, found in the deciduous forests of Burma). 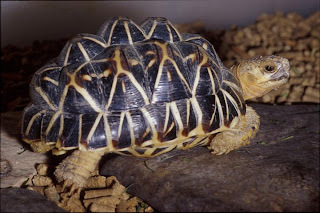 As it's name suggests the Indian star tortoise is found across the Indian sub-continent, more specifically, the Indian star tortoise is found in the central and Southern parts of India, in West Pakistan and in Sri Lanka. The Indian star tortoise is most commonly found in semi-arid scrub forest, along with thorny and grassland habitats, where there is plenty of vegetation both to hide in and munch on. Due to the very distinctively marked, and highly rounded shell of the Indian star tortoise, this species of tortoise has become a popular pet in the world's exotic pet trade. 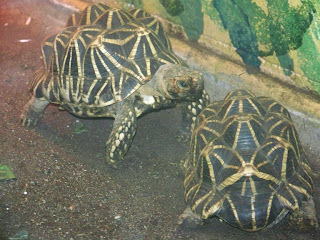 Indian star tortoises are of a medium size, with the average adult rarely growing to more than 30 cm in length. The protective shell of the Indian star tortoise also acts in the same to the shells of other tortoise species, allowing the Indian star tortoise to draw it's vulnerable head and limbs into it's shell for protection. The attractive star-like patterns on the shell of the Indian star tortoise actually help the tortoise to blend into it's surroundings more easily, as well as looking very pretty. The distinctively marked shell of the Indian star tortoise, actually breaks up the hard line of it's shell when it is grazing, making this reptile not so obvious to passing predators. Like many other species of tortoise around the world, the Indian star tortoise is a herbivorous animal that has a purely vegetarian diet. The Indian star tortoise browses in the dry forests of the Indian sub-continent in search of a wide variety of plant life from leaves, to fruits and berries and numerous different species of flower that are found growing in such arid environments. 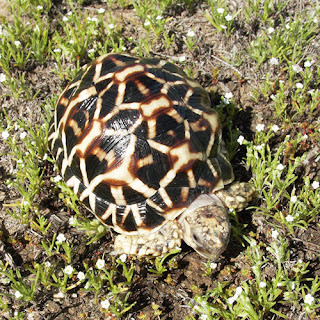 Despite it's hard and protective outer shell, the Indian star tortoise is successfully preyed upon by a number of other animals in their native habitats. Large birds of prey and other reptiles such as snakes are the most common predators of the Indian star tortoise along with humans that have both hunted the tortoise for food, as well capturing them for the exotic pet trade and moving in on their native habitats. 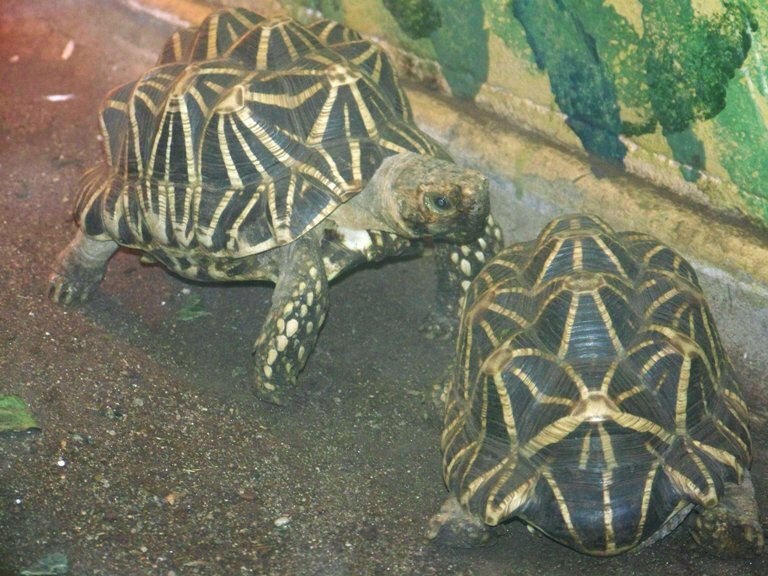 The Indian star tortoise begins its mating season with the coming of the monsoon, so the exact time is dependent on the area in which the individual lives. 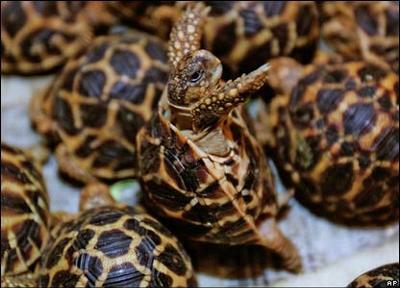 Female Indian star tortoise lay an average of 7 eggs per clutch although, this can be as many as 10. 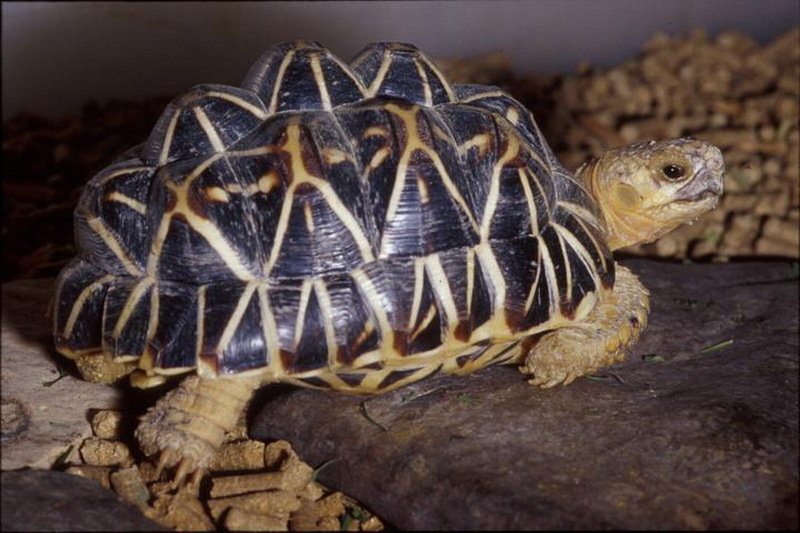 The Indian star tortoise is known to be difficult to be breed in captivity and so should only be attempted by experience breeders. 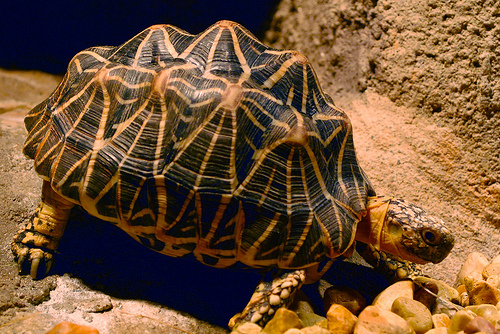 Today, the Indian star tortoise has been listed as Least concern which means that allow this species is not under immediate threat from extinction, population numbers are falling across much of the Indian star tortoise's native range thanks to habitat loss and the introduction of other predators to their natural habitats. 0 Response to "Indian Star Tortoise"